Theresa May and the Tories continually use the anti-Semitism furore to distract attention away from their lamentable track record in government, but when it comes to the crunch their actions speak louder than words. When it comes to proof of higher rates of anti-Semitism in the Tory ranks, Theresa May does nothing to weed out anti-Semitism in her own party's ranks. When it comes to other forms of bigotry it's even worse, with the Tory party outright stonewalling calls for an inquiry into anti-Muslim bigotry in the Tory party from the Muslim Council of Britain and two Muslim Tory politicians. But the actions of the Tory group of MEPs in the European Parliament absolutely take the biscuit, with 17 of the 19 voting against a motion of censure against Viktor Orbán's blatantly anti-Semitic and anti-Muslim government in Hungary. The right-wing Hungarian government has been interfering in the independence of the Hungarian judiciary in order to stack it with pro-government judges, attacking press freedoms, and using anti-Semitic smear campaigns. The European Parliament motion of censure against the Hungarian government for their attacks on the independence of the judiciary and press freedom was passed by 448 votes to 197 after the vast majority of liberal, socialist, green, and centre-right conservative MEPs supported it, but it's deeply concerning that the Tory party aligned themselves with the rag-tag bunch of extreme-right parties that opposed it. 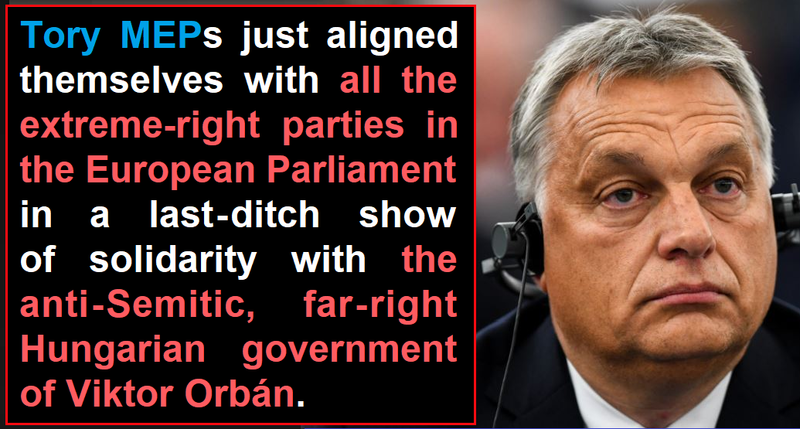 The parties the Tories decided to side with include Orbán's own Fidesz party, UKIP, the French neo-fascists Front National, the extreme-right Italian Northern League, the Nazi-founded Swedish Democrats, and the extreme-right Polish government who are enacting similar judiciary-rigging and free speech repressing policies themselves. Theresa May then attempted to wash her hands of this scandalous vote with claims that she was unaware of the vote, as if incompetence is somehow an excuse for her allowing members of her party to side with a judiciary-rigging, rights-quashing bunch of extreme-right anti-Semites! So when it comes to Tories weaponising anti-Semitism in order to score points against Labour, just remember that when it comes to actions, the Tories align themselves against the political majority in Europe to stand shoulder to shoulder with the extreme-right to defend the anti-Semitic extremist Viktor Orbán!